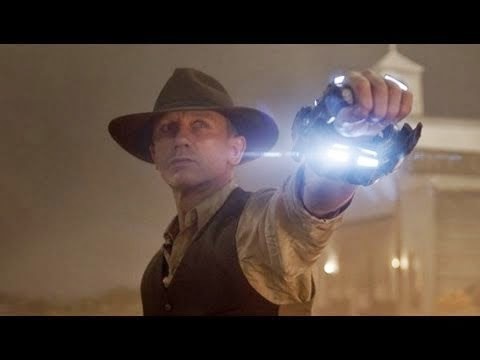 There is a golden rule for writing a blockbuster. The hero (the protagonist) must end up fighting for what (s)he believes in, alone, and against insuperable odds. And of course the hero must win. In order to win, they must go up against their own darkest fears, overcome their main weakness. As readers we like conflict - no conflict, no interest. So the conflict is maximized when it's both internal and external. 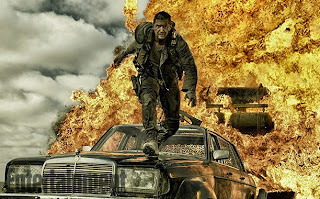 In a book, there has to be a lot of internal conflict, because we as readers have to imagine it, and on the page that can be easier than imagining big explosions and car chases. On film, the reverse is true - for blockbusters, there are more special effects and carnage than internal conflict, That's ok, books and films are different media, and we can all make up our minds what to see/read. 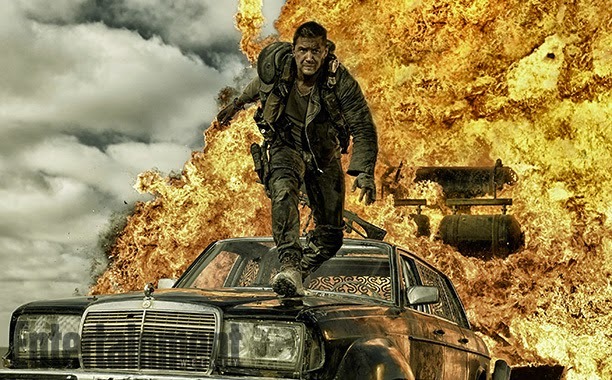 The latest blockbuster, Mad Max Fury Road, is extremely high on the external conflict, less so on internal conflict, since we don't get to know the characters well enough. But it breaks the golden rule. How? First, let's dig deeper into the golden rule itself, what lies underneath. 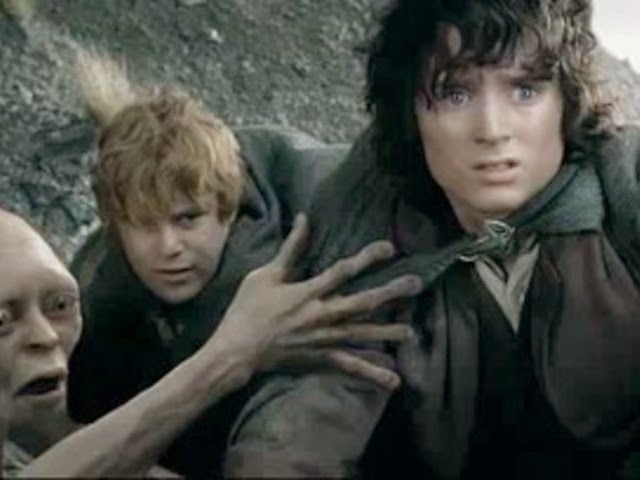 One of the most successful blockbusters of all time is the Lord of the Rings. A bunch of characters go up against the embodiment of evil, Sauron, who has marshaled a terrifying army to drag the world into chaos and despair. Each of the fighters has their own internal conflict, for example, Boromir, and in his case it is his undoing, though it leads to his brother doing the right thing when it counts. 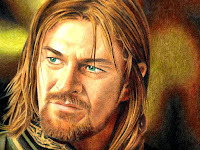 And look at the photo of Frodo. Is he confident, or is he scared? He's about to enter Mordor, and he's just a Hobbit, not a Ranger. Do you get the point? He's like us. We see us in him, facing terrible odds. We are glued to the page, and to the screen. Think Harry Potter. 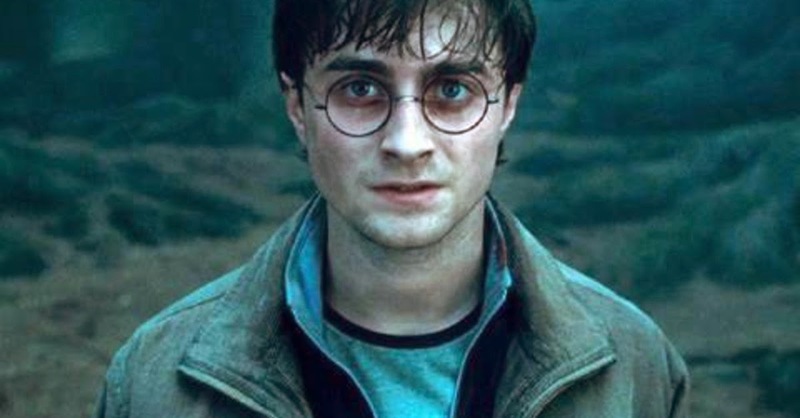 Sure, he has his friends, but how many times does he end up against Voldemort alone, especially in the grand finale? And he's been told he must die in order to win. He has to sacrifice himself as his mother did the first time, to protect him. How would you feel? Again, he is like many of us, a normal person who feels unexceptional, thrust into a destiny with huge consequences. 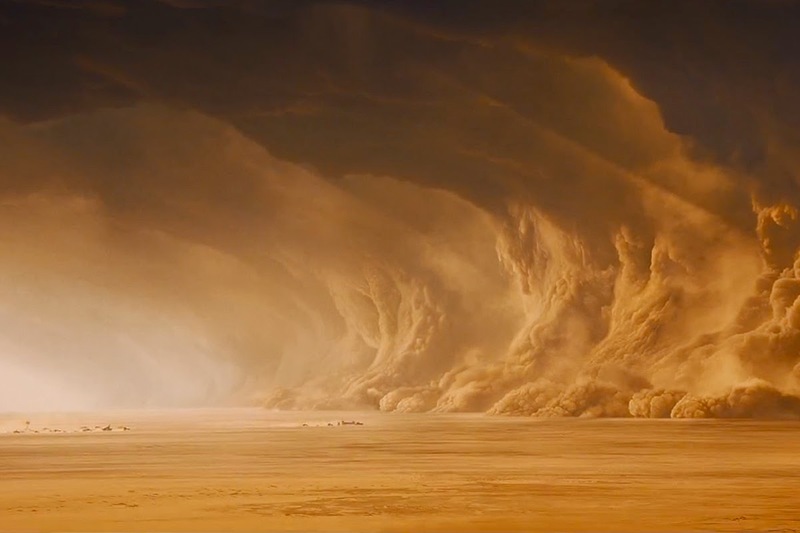 I just watched Mad Max Fury Road. I liked it. It's a blockbuster, sure, but it does something a little different. It breaks a golden rule. First, as already mentioned, there is not much internal conflict. The two protagonists are both damaged, internally scarred by events we don't get to see, though they are hinted at. But that's okay, this is high-octane adrenaline-pumping action, it's relentless without being breathless, and the choreography and special effects are flawless. It's also reminiscent of the original series of films which I loved (well, the first and second, at any rate). It also, as an aside, paints an interesting vision of post-apocalyptic Earth, the screenplay sublime in resisting of the urge to explain anything, including the very obvious question of 'Who killed our world? 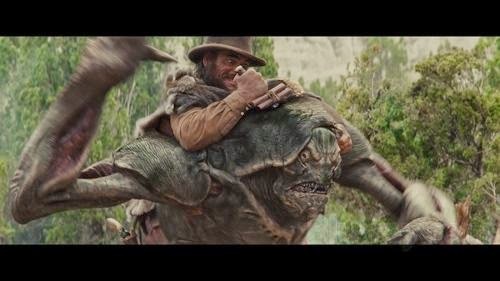 ', as is asked in the film, and so plunges the viewer into the heart of what life in this desert world is all about, survival, where the past is gone and largely irrelevant. The survivors don't know what happened - why would they? What's interesting is that the film is about an unlikely partnership, rather than being about Max himself. This means that at the end they both face extreme jeopardy. 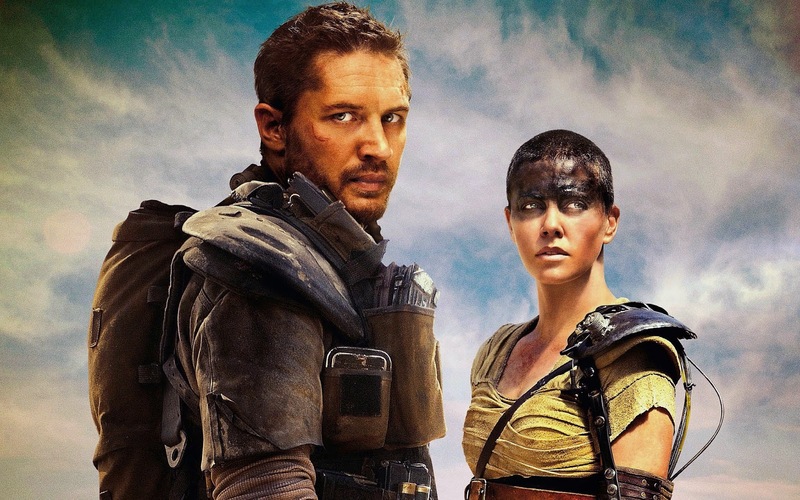 Arguably, the Furiosa character played by Charlize Theron, faces more, and to my mind she steals the show. So, this breaks the golden rule, because the protagonist (Max) does not face the highest risk alone. Does it work? For me yes, and it's more realistic. Our world is very complex, and it's becoming increasingly unlikely that one person alone will save the day. In fact, in the film other characters - who incidentally the viewer might relate to more easily - also do their bit in saving the day. But breaking this rule can go wrong. For me, the latest Avengers film (the Age of Ultron) tried to do more 'internal conflict' than it could handle, and got bogged down. Usually, although these films are about 'teams', the one character who you would reckon is the central protagonist is Iron Man, because he's more like us, rather than say, Thor, and because he's also the best actor. However, the way he and all the rest of them faced their own personal demons got too complicated, and dispersed any emotional attachment the viewer might have for them. Scarletta Johannson (Black Widow) saved the film for me - just - as her character handled both internal and external conflict well. I began to care less about what happened to the others. 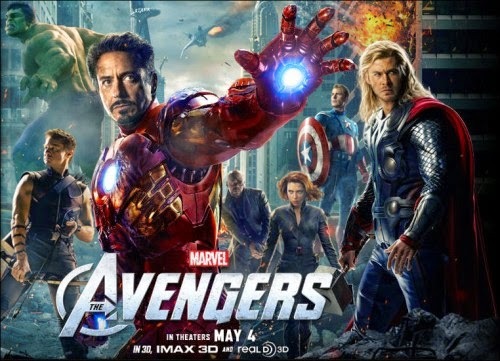 In a book, it could have worked, but then the Avengers is not based on a book, but on comics, and it should stick to the medium; maybe one character can have strong emotional turmoil, but not all of them. 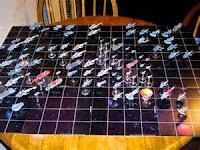 Imagine a chess game played to win or lose an entire galaxy. If you step back from the human involvement in the story, this is the basic premise of the finale to the Eden Paradox series, Eden's Endgame. Two incredibly advanced aliens, Hellera and Qorall, are fighting over the Milky Way, Hellera to save it, Qorall to destroy it. And it's not the first time they've played. Two billion years ago, Qorall lost, and an entire galaxy was destroyed. He wants revenge. The humans, barely a pawn in this titanic struggle, are naturally on Hellera's side; well, most of them. The high-stakes game they are playing would be more akin to five-dimensional chess, since after the obvious three dimensions and the fourth temporal one, rendered more complex by time dilation effects when considering galactic distances, they each have access to a fifth dimension, though not the same one. Both have surprises up their sleeves. Hellera's surprise is what the Spiders - co-habitants on Esperia where humanity's refugees live - can do, and Qorall's surprise relates to a black hole he has weaponised. 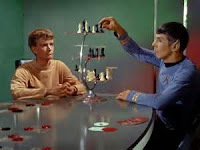 Of course it's not really chess they are playing, but the metaphor is apt, as it is all about deep, very long strategies, and savage all-or-nothing tactics. 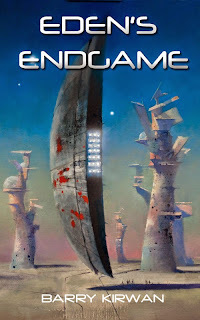 The opening move actually occurs two books earlier, in Eden's Trial, in a chapter which I also published as a quirky short story (you can read it here), as the galactic incursion is seen from the viewpoint of an amorous drone. It then ramps up in the third book, Eden's Revenge, but the final face-off doesn't occur until the penultimate chapter at Hell's End, a galactic level 'Battle of Waterloo'. Does humanity play a pivotal role? Well, let's just say that even a lowly pawn can still make a decisive move in chess. Hellera surveyed the warscape. Qorall’s asteroid ship hovered just off the event horizon of his customised black hole, a few million miles from a rip in the galactic barrier’s fabric. Surrounding him in space tinged a ghostly green were three fleets, the first two cannon-fodder, Level Seven and Eight species she no longer cared about. Some had very large, Mega-Class ships, ten times the size of her own Crossbow, but after Level Fourteen one learned that bigger ships only meant easier targets. The third fleet was more of a challenge: Nchkani vessels, a hundred and eighty of them. They were manned by Q’Roth, but that didn’t make them any less dangerous, and Qorall’s greenspace neutralised Hellera’s gravity-based weapons. 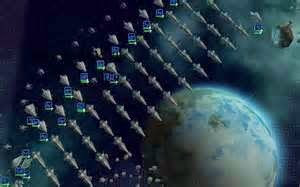 On her side were a dozen fleets, the ones that mattered being the twenty-seven remaining Tla Beth Gyroscope ships, forty-seven Rangers in assorted small but well-armed scout ships, and fifty Ossyrian Diamond ships. The latter had drawn her attention, not because of their fire-power – they were no match for Nchkani – but because the Ossyrians had obviously retrograded, escaping their pacifist yoke, and had quickly fabricated war ships that had terrorised the galaxy sixty thousand years earlier. Each Diamond ship was fashioned from the joining of the bases of two hospital pyramid ships. Hellera reflected that directive evolution was painstaking, requiring careful steps over hundreds of millennia, whereas species regression, by comparison, was as easy as falling off a cliff. She waited for one more ship to join her armada. She switched her sensors to show the Spider ships and Hohash in the underlying subspace, contingents of Shrell accompanying them. Qorall could probably see them too, and must be wondering about their capability. 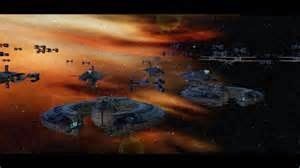 At least he appeared to have no soldiers in subspace. Hyper-assessments had yielded uncertain results: the emergent predictions of who would win remained unstable. Reluctantly she downgraded into a more basic analytic framework. Kalaran had trusted these humans, and had confided in her that there was something about the crude and undisciplined nature of their thinking processes that had tactical value, so she uploaded one of the templates Kalaran had extracted, Blake’s, and fed it with data using a ridiculously small bandwidth. The black hole: that was the problem. Neither she nor Kalaran had been able to fathom what it was exactly, as it was certainly not a normal singularity. Each galaxy she had visited – quite a few during her lifetime – tended towards a maximum number of black holes, reaching an equilibrium. 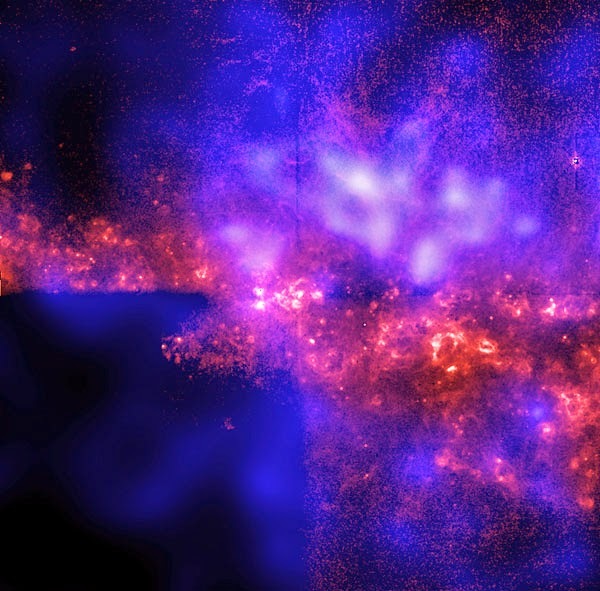 They were nodes, intersections between universes, but not necessarily portals. Only twice had the Kalarash broken through to another universe, the first time it had been a one-way trip and their colleague was never heard from again, and the second was one where the laws of physics were different, the habitat of the Spiders. Their universe was smaller and ran faster – it would end long before this one – hence the Spiders had also been keen to explore other universes than their own time-limited space. They had travelled to fifty other universes, but few contained the conditions for sentient life; some had already fizzled out, others would stretch endlessly without organic species, bland space deserts spattered with dark stars in an endless ocean of space marred by vicious gravitational fluctuations. 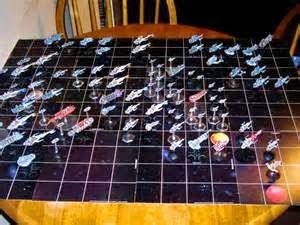 In strategy terms, she held more firepower than Qorall. She should win. But since Qorall had defeated Kalaran, she had doubts. Qorall had been a game-changer since starting this current war: penetrating the Galactic Barrier, using organic weapons, the Orbs… Perhaps he had not yet run out of surprises. Shiva arrived. Hellera contacted the ship mind and downloaded all its data. All had gone according to plan, except the second Queen, but Micah had handled that one. She was about to dissolve Blake’s template, but elected to keep it running in the background. Hellera stared hard at his black hole, his fleets of ships, and his greenspace. She realised she was missing something. He must know by now that his super white hole device at the galactic core had been neutralised. Yet Qorall had never bluffed before. He had, as Blake would have said, something else up his sleeve. But she had no idea what it was. She signalled her fleets to prepare to engage. 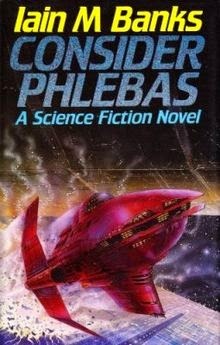 One of the things I most love about science fiction is space-ships. Having grown up during the space race, I naturally wanted to be an astronaut. 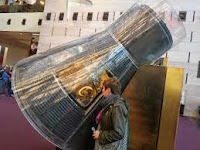 I go to Washington DC every year or so, and when I get the chance, I dip into the Smithsonian Air and Space Museum, and take a look at the early Mercury and Apollo capsules, and see how unbelievably cramped they were. 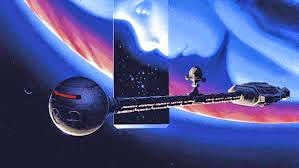 My first dalliance with scifi ships was via the film 2001 a Space Odyssey, where I was mesmerized both by the space station twirling to the sounds of Strauss, and the longer ship heading out to Jupiter. And of course there was the malevolent computer, HAL (you probably know this, but HAL is one letter backwards from IBM, the computer giant at the time). In Scifi I was less interested in ships that were simply hardware, like Star Trek, and more interested in ships that had intelligence, and a personality of their own. 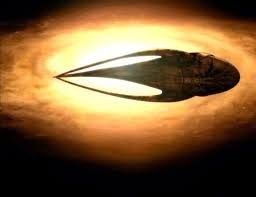 Iain Banks had mindships in a number of his books, and Peter F Hamilton had ships that were born in space or gas giants, echoed in the Farscape scifi TV series. Blake and Micah gazed at the Scintarelli Scythe-ship hovering silently a foot off the ground like a massive, dark crescent, while they waited for Jen to arrive. There were no windows, protuberances or even ridges or exhaust holes anywhere on the smooth, matt black exterior. Where they stood, near one of the two ‘blunt ends’ as Blake had put it, the ship stretched upwards about four decks in human terms. Earlier, they had walked to the middle of the curved vessel, to the ‘sharp end’ that was about one deck high, where Micah presumed the bridge to be. The ship’s entire leading edge tapered to a razor’s width that he didn’t want to put to the test with his finger. The vessel looked powerful enough to slice through another ship and remain intact. Jen had told him that the Scintarelli, legendary master ship-builders, hated all other ship designs so much they ensured their own could reap them like wheat. Evidently the Scintarelli wanted their ships to live up to their names. Standing at the rear end of the ship, Micah wanted to touch its dark hull, but Ukrull had been very clear on that matter, and so he and the gathered crowd stood away from the ship. There were no visible signs of thrusters, engines, or gun ports, though he knew it had formidable weapons. When asked, Jen had confirmed that it had no teleportation – only Kalarash ships and Ukrull’s Ice Pick had such capability, as well as Ngank surgeons whose physiology was extraordinary even by galactic standards. But there were two heavily-armed Rapier shuttle-craft in the aft sections, which they could use to descend to Savange. Also, the Scythe’s shields were coated with a specific form of strange matter, impervious to anti-matter and most other weapons; something Hellera had added, apparently. Jen carved her way through the throng, making a bee-line towards him. “Touch the craft, Micah,” she said in a business-like fashion. He stared at her a moment then walked toward the closest rear-end of the ship, the crowd stilling as he raised his hand and then pressed his right palm to the metal. It was cool, but quickly warmed to his body temperature. He felt something, almost heard something calling as if from far away, like the distant shriek of an eagle. His resident blurred into action, numbers and strange alphabets whirring through his mind’s eye. Images from the recent past flashed by in subliminal fashion for several minutes, before settling on Louise’s face when he’d last seen her, Antonia and Sandy, and the location of Savange on the holomap Jen had shown them three weeks earlier. He withdrew his hand, understanding – it was an intelligent ship, now attuned to his way of thinking, his goals, even his values and ethics. It would anticipate his needs, and never disappoint. That was the introduction, but in Eden's Endgame, the final book in the series, Micah and Shiva get to know each other. But Shiva, above all, is a warship, and relishes battle. Below is the section I sent to legendary scifi artist John Harris, who then conjured up the artwork for Shiva that became the front cover. What you see here is the first sketch, in pastels, and lower down, the final cover design from a painting in oils. Shiva burst through the cloud layer, and raced down towards the purple savannah studded with green pines that led to Savange City. Micah found himself edging backwards into his chair as the tree-line rushed upwards. At the last millisecond, Shiva pulled up and cleaved a furrow between fir trees, bolting forwards at an altitude of twenty metres and a speed of five hundred kilometres an hour. The aft screen showed pine trees ablaze. “Sure,” Micah said, trying to breathe normally. To the East, the orbital tether continued to fall from orbit, coiling giant loops that pummelled into the ground, flattening trees, sparking fires, and shattering boulders into plumes of dust. The city was to the South, so the natural spin of the planet meant the tether fell away from the inhabitants; Micah presumed they’d planned it that way, just in case. He leant back, tried to slow his heart rate, which his resident was inconveniently displaying in the corner of his right eye. “Vashta, you have all their life signs and locations? A display next to Micah opened up: the terrain ahead, the city, and beneath, where all except Kat were. They flashed over a lake, and Shiva dipped lower, sending a fountain of water up into the sky behind them. The display blazed white, then red, then white again. Then the screen readjusted, filtering out the high energy plasma fire so he could see the tracer lines coming from two towers at the edge of the city. 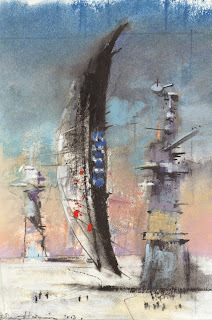 At first they reminded him of battleship towers, as if some giant vessel had been buried just below ground level. Each tower had an array of weapons turrets and cannons, almost all of which were firing simultaneously. The intensity of the energy bearing down on them was igniting everything between Shiva and the towers, creating a tunnel of fire. He wondered how they protected the city from the heat and backwash radiation, then he saw it; a shield, similar to the one around the orbital city. A mauve circle spat out ahead of them, unperturbed by enemy beams, and grew in size, then narrowed into a cone that sped off and disappeared. 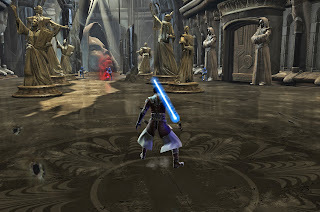 A second later, the shield fizzed and died, and the enemy beams cut off; an intelligent protection system, since there was no point having a defence grid that killed most of Savange’s population. Shiva slowed so fast that thunder roared around them, then she slewed lazily between the two towers. “Drop-zone,” Shiva said. “Okay, bore the hole.” Micah turned to Vashta. “The Bridge is yours.” He ran to the aft of the ship, knowing that Shiva was tilting to a vertical position, from whence she would core a deep shaft. She slammed into his back, and locked her arms around his waist, just as Shiva roared off to combat another weapons-tower. 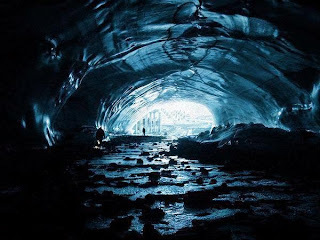 He let the sled drop like a stone, no lights, his resident projecting an image of the polished cylinder around him, and the floor a kilometre below to the fiftieth level; where Sandy, Antonia and the other captives were, and where Louise would be waiting. Shiva plays a pivotal role at the end of the book, in the climactic battle at Hell's End, but I don't want to give too much away about that. By the way, a ship is always female. If you read the series, you find out why.